The system is now undergoing piecemeal implementation across various major cities and is now invading people's lives in all kinds of extreme ways from public transportation to dog-walking to flagging pedestrians for crossing the street in an unsafe manner . The system is currently far from being universally in place; however, the country's communist government has plans to rank every citizen — all 1.4 billion of them — by 2020. But various bizarre and rigid policies are already being felt and reported in different parts of China - from the state confiscating pets to dire recorded audio warnings threatening reprisal should commuters on a bullet train not bide by the rules. 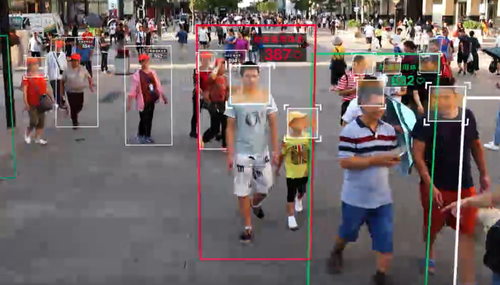 China's electronic "social scoring" utilizes vast networks of surveillance cameras, facial recognition software, A.I. digital monitoring, and extensive databases, was first announced in 2014 and aims to reinforce the idea that "keeping trust is glorious and breaking trust is disgraceful," according to a government document — though we're not sure if forgetting a pooper-scooper while taking the dog out warrants being digitally blacklisted by an all-seeing digital eye. As scary as the whole program sounded when it first began receiving more media attention a year ago, to see it in action in the form of deterrent warnings to citizens is absolutely terrifying. 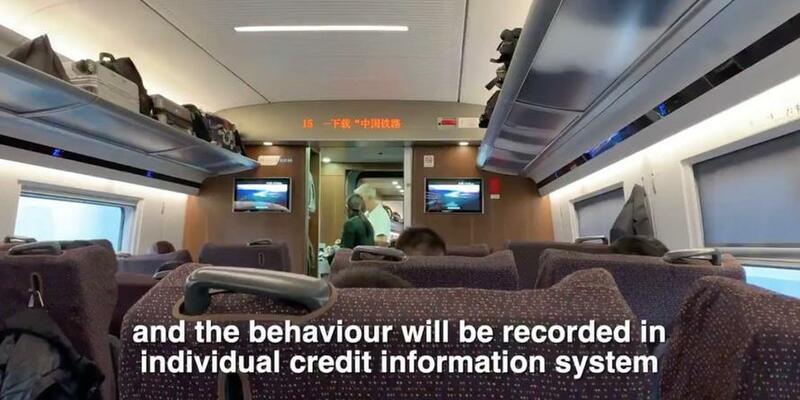 In one particularly jarring example a journalist traveling by bullet train from Beijing to Shanghai recorded an ominous audio message which blared loudly to passengers. The message was issued in Chinese and English, and takes the form of the kind of "safety and procedures" type message that airlines typically present after take-off , but this is the stuff of dystopian nightmare made reality. A female voice can be heard on an intercom threatening people not to misbehave or else their "behavior will be recorded in individual credit information system." The chilling announcement as the commute was in progress reveals the reality that people are already living in fear of the nationwide social credit system. The voice warns that such infractions as travelling without a ticket or people who "behave disorderly" — like smoking in public places — would be "punished according to regulations, and the behavior will be recorded in individual credit information system." The punishments are not defined in the audio message, but the reference to the credit information system means that even minor behavior infractions will be recorded permanently as part of a violator's permanent electronic record. There are already a number of recent reports out of China of people either being punished and rewarded based on their social credit. For example earlier in the year student was denied his spot at university because his father was blacklisted for failing to pay off a 200,000-yuan ($28,700) bank loan. More commonly, people are now routinely barred from taking trains of public transport due to their low score. But perhaps the most shocking aspect of the message recorded on the bullet train is just how seemingly banal it all sounds in the moment: one can easily imagine this kind of thing being rolled out in the West, which some analysts have been warning about.